We’d love your help. Let us know what’s wrong with this preview of The Returned, Part III by Peter David. Captain Mackenzie Calhoun and the crew of the U.S.S. Excalibur are back, picking up three months after the stunning events depicted in New Frontier: Blind Man’s Bluff. Calhoun's search of Xenex has failed to find any survivors, an The final installment in a brand-new three-part digital-first Star Trek: New Frontier e-novel from New York Times bestselling author Peter David! To ask other readers questions about The Returned, Part III, please sign up. Definitely the most exciting and action-packed of The Returned trilogy in the Captain Calhoun world, part three takes a dark turn at times, and there are twists no reader could have foreseen. In some respects, this one reads like a writer taking the more outlandish elements of the New Frontier series to their extremes, which another reviewer also noted. That can be a bad thing if you’re a wholehearted devotee of New Frontier. But if that’s put aside — in fact, put this entire trilogy put aside f Definitely the most exciting and action-packed of The Returned trilogy in the Captain Calhoun world, part three takes a dark turn at times, and there are twists no reader could have foreseen. In some respects, this one reads like a writer taking the more outlandish elements of the New Frontier series to their extremes, which another reviewer also noted. That can be a bad thing if you’re a wholehearted devotee of New Frontier. But if that’s put aside — in fact, put this entire trilogy put aside from that — this is a fast, fun read, with twists and turns worthy of a very good pulp story. And that’s basically how I viewed this third and final entry in the trilogy once it got going. At the end of the second entry, Q appeared to shake things up for McHenry and Robin Lefler, and the baby Cwansi. Yep, Q is the Awesome, and he wants to see just how much power McHenry has. Q decides a contest should ensue, with all the trappings of a Roman battle in the…Well, you get the idea, but what isn’t conveyed is the darkness present here. Rather than Q being a childishly endearing rogue who sometimes gets out of hand, Peter David writes him somewhat out of character, a bit mean-spirited. What happens with the child Cwansi, which I won’t say more about, is an example. Also out of left field, we get some of the Soleta/Calhoun situation — which could have been quite charming — taken to extreme levels. Very extreme. It works out with the author’s explanation, but it seems a poor idea executed rather poorly. Again, it’s like an author unrestrained, where no idea, no matter how contrary to the characters, is given the green light. I can’t stand Shelby, not in the television series, or the ST books. I’d love nothing better than a flip, with Calhoun and Soleta hooking up instead. But this way? And worse, the author cops out at the end, so that doesn’t happen, while at the same time revealing a huge — and I mean huge — story element, then leaving it completely unresolved. A trilogy is supposed to wrap things up with the third entry, not leave something that monumental hanging in the air. New Frontier fans will be happy to see the gang back together, and the story features Peter David's usual whimsy and dabbling in darker story ideas. I would have liked to have seen a deeper exploration of some of the issues at the heart of the story, but that is not to be. Still, I don't think you should skip this if you enjoy New Frontier. There are some developments that are important going forward, and I do truly hope that New Frontier continues to go forward. Full review: http://treklit.blogs New Frontier fans will be happy to see the gang back together, and the story features Peter David's usual whimsy and dabbling in darker story ideas. I would have liked to have seen a deeper exploration of some of the issues at the heart of the story, but that is not to be. Still, I don't think you should skip this if you enjoy New Frontier. There are some developments that are important going forward, and I do truly hope that New Frontier continues to go forward. An attempt to flip the script leaves characters out of sorts. At the end of Star Trek The Returned Part II, Peter David set the stage for the final battle between the forces he so carefully placed upon the chess board. Now, in Part III, we watch as those opponents square off in a nail-biting fight to the death. Meckenzie Calhoun, now free from his manic quest for genocide against those whom destroyed his race, is now face-to-face with his new enemy in an even more dangerous quest to prevent them An attempt to flip the script leaves characters out of sorts. Meckenzie Calhoun, now free from his manic quest for genocide against those whom destroyed his race, is now face-to-face with his new enemy in an even more dangerous quest to prevent them from getting to the Milky Way Galaxy and to end their evil attempt to rid the Universe of all sentient life. Meanwhile, Robin Lefler and Mark Henry have now paired up in both their ongoing struggle against those who would see the death of young Prince Swan and against the all powerful Q. And last but not least, a once trusted crew member whom lost her trust and respect, works hard to regain it when life and death dangles by a thread. So the three main story arcs from the first two installments carry on into the third, but you may be asking why I would give this one only three stars when I gave the first to installments such high praise. Well, to be perfectly honest, Peter David crossed a line in this third one that I still have yet to forgive him for - and I read this over a month ago. In Part three, Peter David attempts to flip the script in many ways, both in story and in character plots. We watch as Mackenzie turned from being hellbent on destroying the race that destroyed his, only to be cut off at the knees by this new but extremely deadly force with incredibly well mannered speech. This introduction eventually showed Mackenzie the error in his genocidal rage, but it also took away his end purpose and taking away much of his purpose in the book. But that arch is the least of my complaints. Second is the interaction between Mackenzie and Soleta. It appears that Peter David wanted to not pull any punches in this trilogy and decided to push the envelope with his characters interactions. This event, which I won't describe in detail, was shocking to say the least. A violation so intense will leave some readers surprised at just how out of left field it is. But even though Soleta crosses a very wide line with Mackenzie, Peter David does find a way to sort things out in the end, and most is forgiven between the characters. But last is the offense I have yet to forgive. About half way through the book, Peter decides to push the envelope as far as it will go. Q and Mark Henry finally have their dual, a dual that Peter cleverly lays out in a way that harkens back to the old TNG TV days. But the interaction between Q and Henry is not where my issue lies, rather in an act that Q perpetrates on young Prince Swan in a scene that I will describe below. If you wish not to read the spoiler jump one paragraph down. In this scene, Q, as described by Peter, assaults young Swan in a very aggressive manner that is completely out of norm for Q. In a battle with Robin and Henry, Peter describes not only the dropping of the child but also the removal of the babies lungs, a scene that leaves the young child gasping for air with nonexistent organs. In all my years of following Trek and being a fan of Q, I have never known him to be cruel for cruel sake. This scene is way outside his established personality and has no place in his character. I'm not sure why Peter found it necessary to have this scene included, even though the ending of Part III tries to iron it out, but to me it is so over the top and not at all what Q is, that it has left me offended to this very day. So, even though Part III has many issues that take some of the shine off of what Part II and Part I set up, it is still one of Peter David's better works. There are things I would have not done, and many things I would not have thought of, but in the end this series is true to what the New Frontier has always been...fun. A decent ending to the series. Give it a read. *Offered in exchange for an honest review. I received a copy of this book from the publisher through Net Galley for an honest review. Part two left me wanting more and then I had to wait for approval for this review copy and time passed. And passed some more and finally I had a copy of part three and a window in which to read it. Finally… Started it last week and immediately realized too much time had passed and I had forgotten where the story left off. This is why I write reviews people, so I can remember what the hell is going on in the I received a copy of this book from the publisher through Net Galley for an honest review. Part two left me wanting more and then I had to wait for approval for this review copy and time passed. And passed some more and finally I had a copy of part three and a window in which to read it. Finally… Started it last week and immediately realized too much time had passed and I had forgotten where the story left off. This is why I write reviews people, so I can remember what the hell is going on in the series I follow. Once I had refreshed my memory I was all What-the-Hell over the direction the author took this last part of the story. I going to confess, I wasn’t a fan of how this mini-series ended. Alright mini-spoiler, but mostly for part two not this one. Q popped up at the end of the second story and while I love Q, I should have realized that this had the potential to lead to some serious plot twists. Q’s story line was mainly linked to the Lefler/McHenry plot thread. This part of the story turned quite strange and quickly turned me off. It is the moment when the story jumped the shark and left me wishing Q had never even entered the plot at all. Calhoun had his own out-of-character moment, but that was limited to a few pages in the beginning of the book. Then there is this whole out of the blue inappropriate and awkward scene between Calhoun and Soleta that was setting up some issues for future books if David decides he wants to continue the series. Quite frankly after reading this story I’m not sure I want to continue on at all or even go back and catch up with the earlier books (I left off at book 4). This story was all over the place and pretty unbelievable at times. Now Trek can be pretty tongue in cheek at times, but this was over the top. My biggest pet peeve was the convenient character popping back in at just the right spot and time to save the day. Once or even twice is alright, but it happen far too often in this story. I struggled with this part and almost set it down several times. If it wasn’t so short I probably would have. The book just felt like the author didn’t give a damn. Like he had lost interest in these characters and their world, but felt obliged to finish the story. I can't tell you the number of times I was thanking the good folks over at NetGalley and Pocket Books for giving me a digital ARC of this e-novella. Picking up where the second part left off (and with a cliffhanger that had me absolutely flummoxed), the third and final installment in "The Returned" is everything I hoped it would be and then some. I can only hope lots and lots of people buy this and that Pocket will give us more of the New Frontier. And I hope that if we get more that David will I can't tell you the number of times I was thanking the good folks over at NetGalley and Pocket Books for giving me a digital ARC of this e-novella. Picking up where the second part left off (and with a cliffhanger that had me absolutely flummoxed), the third and final installment in "The Returned" is everything I hoped it would be and then some. I can only hope lots and lots of people buy this and that Pocket will give us more of the New Frontier. And I hope that if we get more that David will have time in his schedule so we won't have to wait four years for the next installment. The revelation of who is really behind the Awesome on New Thallon ended part two and had me hooked for part three. But there was also the growing threat to the Federation and Calhoun's own increasingly questionable choices. I'm happy to report (hopefully without too many spoilers) that David pays off every single thread in the final installment. And thankfully, while one threat is wrapped up, there are still new things put into play that leave me wanting more and wanting it as soon as possible. With his typical compulsively readable style and superb character work, David once again affirms why he's one of the best writers in the business -- tie-in novel or otherwise. These books put a big grin on my face and made me recall what it is I love about Star Trek -- the entire franchise and not only the New Frontier. This three part series is easily one of the best things I've read this summer. Now, Pocket Books, I beg you -- please give us more. I used to love the new frontier series but it seems the author embraces the most absurd elements of the original series and runs wild with them. While I will always love the new frontier it just seems like it needs to be reined in a bit. If this was the end for the NEW FRONTIER series, then Captain Mackenzie Calhoun and company, went out in grand TNG style... THE RETURNED was well-worth the wait. This review has been hidden because it contains spoilers. To view it, click here. Fun and funny but geez Peter David you killed off Janeway and still can't spell her name - Katherine? Kathryn! This review has been hidden because it contains spoilers. To view it, click here. By my counting, Star Trek: New Frontier: The Returned: Part III is not just the second part of a series-within-a-series, but the 21st novel under the NF banner and 31st chapter overall. Wow I can’t believe I left it hanging in my que for for so long—I actually read this some time ago. I now can’t quite remember all the reasons why I give it a rating that I did I just remember I was not entirely happy with it, and I can’t find any of the notations I made for myself to help collect my thoughts for By my counting, Star Trek: New Frontier: The Returned: Part III is not just the second part of a series-within-a-series, but the 21st novel under the NF banner and 31st chapter overall. Wow I can’t believe I left it hanging in my que for for so long—I actually read this some time ago. I now can’t quite remember all the reasons why I give it a rating that I did I just remember I was not entirely happy with it, and I can’t find any of the notations I made for myself to help collect my thoughts for a review. So I’m not sure if my dissatisfaction with Part II is due to either Peter David’s riding or just my inflated expectations for a story that I’ve been waiting so long for. Eventually I will re-read this book because I really do enjoy the series and I will re-read it all once again probably in about seven or eight years now and I’ll review it then. What I do remember having trouble with was the fact that Mack went on a mission of genocide against the race that destroyed his world and wiped out his people utilizing Federation resources while Starfleet Command (in the form of Shelby and Jellico) willingly looked the other way. I’m really, really bothered by this—words fail me here. I always enjoy the New frontier stories but they are totally preposterous in that Mac has more lives than a cat and always comes out on top, what ever the huge odds against him and his crew. They are all real roller coaster rides full of action and excitement. Glad to see some of the enigma around Mark McInnery is now explained. Excellent series and enjoyable to immerse yourself in the tale of fantasy, particularly if you have been a star trek fan of long standing. Characters may be different but easy to accept when mentally tied in to the old tales. Star Trek: The Returned is probably one of the trekkiest book to have ever trekked. On top of that it’s also a good story. This three part book really surprised me due to the fact that most Star Trek (and Star Wars for that matter) books are over glorified fan service, and hold almost no entertainment value for all but the most diehard fans. These books more or less ditch that format and goes boldly where no one has gone before without completely abandoning its roots. I know it sounds confusing that I just said it was the trekkiest book to have ever trekked but at the same time different, but it just is. I feel that Mister David was concentrating more on writing a good book than on writing a Star Trek book on which I praise him highly for. A few of the steps that made this book more good fiction than fan fiction included using a completely new crew and ship, including almost no appearances by any TV series characters, and slightly changing the usual Star Trek themes here and there. As far as the story goes I’m not going to reveal much, as there are plenty of cliffhangers and massive plot twists and surprises, a few of them I didn’t quite grasp, as I haven’t read the other books in the series. Our story begins with our main character, Captain Mackenzie Calhoun searching the planet Xenex for survivors of an alien attack and slowly deciding that once he finds the aforementioned aliens, he’s going to make them all dead aliens. Remember when I said the author changed the usual Star Trek tropes? Anyway Cap’n Calhoun and the crew of the Excalibur decide to go to a pocket universe to kill all the hostile aliens. Once they get to their destination they meet with an alien species with similar goals and decide to team up even though the Excalibur crew suspect something’s up. Anyway the alien’s double cross the Excalibur and Big Mac’s rage is brought to an end as he realizes the aliens want to escape to our universe and end all other sentient life, like a bunch alien space Nazis. Q is also involved though the Excalibur crew does not know why. Anyway this trilogy contained a final plot twist that was both massive and felt like it came right out of an unaired episode of the original series. The whole story was well written and very original and is easily worth every penny of its purchasing price. To Mister David I say well done. My only problem is that the last book had some twists that helped the story but didn’t match some of the characters personalities. 4 stars and for trekkiness I give it a Tribble / 10. A couple of disclosures: This is part three of a three-part series, and while I read/reviewed the first book (see that review here), I did not receive a review copy of the second part. One of the things I noted in the first book is that it isn't a stand-alone book. The three books must be together for a complete story, and I don't think very highly of books published this way. And of course, if you don't have part of the story, it definitely makes it difficult to review the book. But if the publishers are going to publish this way, then it deserves to be reviewed this way. This is a Star Trek: New Frontiers story, featuring Captain Mackenzie Calhoun and the crew of the U.S.S. Excalibur, and I have enjoyed all of these stories that I've read previously. It is a welcome sight to see them all back again. There appears to have been another couple of cliff-hangers at the end of the second book. In fact, just as the first book was a whirlwind of action, so is book three, but the reader is a bit behind here. Calhoun is no longer trying to destroy those who eradicated his race. In fact he seems to have had a change of heart toward those survivors on board his ship. There was the typical amazing Peter David energy and multiple storylines converging here, but there was one aspect that brought this book down for me. Q.
I don't know if Q was in book two or not, but he makes his presence known here and plays a significant role. I am not a fan of the character Q. I feel he's been over-used as an antagonist in Star Trek stories, and he's just not that interesting to me. This book does not change my impression of the character, despite David's handling of him (and I think David is a fine writer). I really like the New Frontier spin-off series, and I think Peter David is a tremendous writer and does a really nice job in the Star Trek universe, but this book, AS a book, does not hold up. And as the third part of a series? Perhaps fine, but I would need to read all three to get a sense of the story. Looking for a good book? Peter David writes in the Star Trek world as well as anyone, and it's great to have his New Frontiers series back in action, but this mini-book, The Returned, Part III, should have been published as one book as this definitely does not stand alone as a book. Cada regreso de la tripulación de la Excalibur es a la vez una alegría y un temor. La alegría de volver a disfrutar de los personajes creados por Peter David, del humor irreverente y del espíritu de la Star Trek de toda la vida con un toque mas humano y real que las historias originales. Pero también conlleva temor, porque desde hace años cada novela es prácticamente un milagro, tal y como esta el panorama. Somos muchos los que tenemos cariño a los personajes, pero la verdad es que tras tantos a Cada regreso de la tripulación de la Excalibur es a la vez una alegría y un temor. La alegría de volver a disfrutar de los personajes creados por Peter David, del humor irreverente y del espíritu de la Star Trek de toda la vida con un toque mas humano y real que las historias originales. Pero también conlleva temor, porque desde hace años cada novela es prácticamente un milagro, tal y como esta el panorama. En cuanto a las novelas en si, Peter David sigue explotando su punto fuerte, que es basarse sobretodo en el desarrollo de los personajes, en ponerles en aprietos y en buscar nuevas maneras de hacerlos evolucionar. Tras tantas novelas son muchos los personajes, y no todos pueden recibir el tratamiento que se merecen, pero en lineas generales consigue reconectarnos con los principales, con la tripulación de la Excalibur, y cerrar una linea argumental que se había estado desarrollando durante los últimos libros, y que por un tiempo parecía correr el riesgo de quedar inconclusa. De este modo nos da un posible punto final a los lectores de toda la vida, pero dejando margen para una nueva etapa con algunas sorpresas que deja entrever en las ultimas paginas. Very quickly, I realized that my habit of only reading TNG novels meant I had no idea what was going on, so I bought parts I and II of this trilogy and binge-read al Peter David has long been one of my favorite writers of professional TrekFic – there’s a line he wrote decades ago about human male chest hair being for traction that has stuck with me for decades – so when I saw the last installment of the ebook trilogy in the New Frontier universe on NetGalley earlier this summer, I had to read it. “The Returned Part 3” eBook was published in 2015 (September) and was written by Peter David (http://www.peterdavid.net). Mr. David has written over 50 novels and many short stories. This novel is the 21st in his ‘Star Trek: New Frontier’ series. I obtained a galley of this novel for review through https://www.netgalley.com. I would categorize this novel as ‘R’ as there are instances of Violence, Mature Language and Mature Situations. This Science Fiction novel is set in the future of the Star Tr “The Returned Part 3” eBook was published in 2015 (September) and was written by Peter David (http://www.peterdavid.net). Mr. David has written over 50 novels and many short stories. This novel is the 21st in his ‘Star Trek: New Frontier’ series. I obtained a galley of this novel for review through https://www.netgalley.com. I would categorize this novel as ‘R’ as there are instances of Violence, Mature Language and Mature Situations. This Science Fiction novel is set in the future of the Star Trek universe. This book takes up immediately at the conclusion of “The Returned Part 2”. The primary character is Captain Mackenzie Calhoun who is Captain of the USS Excalibur. Calhoun and the crew of the Excalibur are in the pocket universe of the D'myurj. The new race, the Dayan, are now their enemy. The D’myuri are extremely powerful and want to wipe the all life in the universe from existence. Calhoun and the crew of the Excalibur play a cat-and-mouse game with the D’myuri, trying to escape and leave them in the pocket universe. Meanwhile, Mark McHenry, Robin Lefler and her son are dealing with Q on the Thallonian home world. The story fell into the model of most Star Trek yarns. I enjoyed the 3 hours I spent with the story (making it more of a novella) and I give this novel a 4 out of 5. I've come to realize in reading Star Trek novels, not all writers are able to capture and bring to life the the qualities of the Star Trek characters and create a vibrant, action packed sci-fi story. A story that keeps you on your toes and makes you feel as if you have come home to the world of Star Trek, whether you are reading the original series or a new book series. Peter David excels at this and that is why he is one of my favorite Star Trek authors! With Star Trek: New Frontiers: The Returne I've come to realize in reading Star Trek novels, not all writers are able to capture and bring to life the the qualities of the Star Trek characters and create a vibrant, action packed sci-fi story. A story that keeps you on your toes and makes you feel as if you have come home to the world of Star Trek, whether you are reading the original series or a new book series. With Star Trek: New Frontiers: The Returned, Part lll he hit the nail on the head! I loved this book. The characters are well written, the story jumped off the pages and grabbed me from the first paragraph till the last. I haven't read this series Part 1 and Part 2 but I was able to follow along with the story and fully enjoy it. Still, this book was published in three parts and in retrospect, I believe that my reading experience of Part 3 would have been enriched if I had read the three parts in order. I give Star Trek: New Frontiers: The Returned, Part III a full 5 stars! I was given an electronic copy of this book by Gallery, Threshold, Pocket Books and NetGalley, in exchange for an honest review. In the span of this final book in The Returned three part series, Captain Mackenzie Calhoun loses control, changes his mind, becomes diplomatic, and effectively dooms Earth if he cannot come up with an alternative solution. Take out Calhoun's name and you can put in most of the other Captain's from Starfleet history. This book is mostly true to the Star Trek universe, w I was given an electronic copy of this book by Gallery, Threshold, Pocket Books and NetGalley, in exchange for an honest review. Happenstance endings, or an ending that is brought about not by the ingenuity of the main protagonist, but by some external force is a disappointment. The Excalibur and Calhoon didn’t A fight between gods. A genocidal race of super beings that can’t be stopped. The Excalibur against all odds in a race to save our galaxy. These are some of the themes in part three. 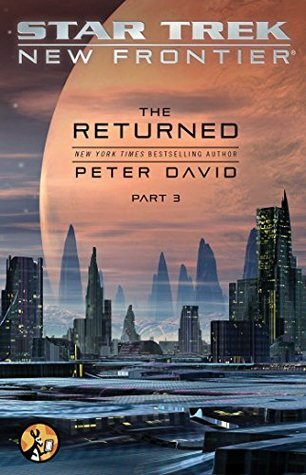 The romp through sci-fi by Peter Allen David had to end, and the conclusion to “The Returned” was high-octane until the last chapter. In the conclusion to the three part novel, Calhoun and his crew are still trapped in the pocket universe, being pursued. Meanwhile, on New Thallon, Robin Lefler, Cwansi and Mark McHenry now discover that they are dealing with Q which means that all bets are off. I enjoyed this three part novel. I would read another if it came out. He definitely left it open to more books with the shocking ending. The first two books were great so I was excited for this conclusion. Was totally not what I expected. The final book left me with mixed emotions. Part of me really enjoyed it and the other part me absolutely hated the direction the storyline took. Honestly could have been made into two books instead of three. And the way it ended...if this is the potentially the last book of new frontier...not a good ending. I enjoyed this 3 part book set. While there were some twists, the typical solutions were well within the Star Trek traditions. The concept of a pocket universe expanded the villainous aliens. Plus the interrelationships between this crew was satisfactorily explored. Peter David continues to write superbly. Star Trek: New Frontier: The Returned: Part III - The conclusion of the current trilogy of E-books, so things come to a head in a variety of ways, and the stage is set for future hijinks. The story resolves in some interesting ways, as the various threads come together nicely, but once again we are left on a cliffhanger. How certain are we that more is to come...? Never a disappointment - Peter David knows his stuff! I'll admit, I've not followed all the New Frontier Trek stories - I think I need to revisit them. I got signed up for this serialized adventure and it was terrific. His charactes and ideas are well integrated into the 'verse of TNG and beyond. It looks like there could be more NF books!